After underlining his Series ambitions with victory in the opening round a fortnight ago, I Ride RT’s Matt Bottrill continued to chase the Rudy Project Time Trial Series with a good performance in the second round in Hampshire on Saturday. However, his time of 1-18-13 was only good enough for second place over the 35.4-mile course, with Sigma Sport pro Wouter Sybrandy taking top step on the podium. Sybrandy, a 24-year-old Dutch rider living in Middlesex, clocked 1-17-54 to secure victory and continue his good run of time trial results, albeit sporadic. “He’s a strong rider, but thankfully he’s not riding the whole series,” said Leicestershire-based Bottrill afterwards. “I was happy with my performance and the time I did. I felt it went OK, but it’s hard to gauge how it’s going on a course of that length. Third spot went to Chippenham and District Wheelers’ Jeff Jones, 2-16 behind Bottrill, although Jones will be happy enough to have beaten Colin Robertson to third place after the Scottish CU rider edged Jones for second spot in the opening round. Last man off was Michael Hutchinson (In Gear-Quickvit RT) who was looking good until he punctured and was a non-finisher. A former winner of the series on several occasions, Hutchinson is using the events to underline his bid for selection for the Commonwealth Games. Sarah Storey (Horizon Fitness RT) continued her phenomenal run of results with a win in the women’s category. 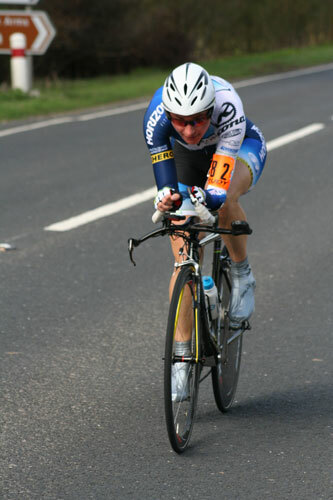 Storey clocked a time of 58-52 on the 24.7-mile course – the only rider to record a sub-hour time. Michelle King (Cult Racing) placed second with 1-01-27 with her team-mate Jane Kilmartin in third with 1-03-54. See this week’s Cycling Weekly for more on Matt Bottrill’s Rudy Project Series hopes.